I like a lot of people have an unlocked iphone (not to be confused with a Jail broken one). So on installing the 3.0 update MMS was immediately available but I suspect, like me, for most it won’t actually be active (no little camera icon in Messages is an indicator if it’s working or not). 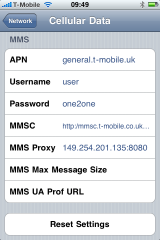 If this is the case all you need to do is enter your MMS settings (a quick Google should provide you with the correct info – UK users can grab them here) via the steps below. It’s worth pointing out that if you have an unlocked iPhone you don’t need to do any of the ipcc file hacking that a lot of the “beta” articles seemed to indicate. The MMS option should be alreay present and just need configuring. If you’re with an official carrier like AT&T or O2 etc the process may be completely different as it seems to require hacking the ipcc file to set certain values so your mileage may vary. Have an unlocked Iphone and been trying to work this out and now it works. both worked for sending pictures out, but not receiving them. I got the msg “the media content was not included due to a picture resolution or message size restriction” for both cases when my friend tried to send me picture text messaging. I also check out the xda phone link that Mike provided but it didnt work with iphone either. any resolution yet? Has anyone figured out what Tigger asked? This is the same problem I am having. Thanks! The FIX to send & RECEIVE!!! This is how to do it. My phone spec is 3g 16gig 3.0 firmware jailbroken with Tmobile WITHOUT data plan. 9. Go all the way back to Settings and then press Home. 10. Turn off the phone. 11. Wait for the phone to completely power off, wait 30 seconds and then power back on. 12. If your phone crashes and you get the Sad Phone Face, it’s fine, unlock the phone and reset the Springboard if need be. 13. Now have someone send you a Picture Message and make sure you can send out MMS. PLEASE NOTE! ~ Follow it step by step. I started without installing the application and it displayed the same message to big message. Followed the instructions precisely and up and running. Sister w/ verizon sent me a picture message. Also, my Data roaming is set to off now and it still works. But I have a question, my carrier is T-Mobile and I have unlimited texting, now that I can send and recieve pics will it overcharge me? actually my question was for jaren about the MMS..if it does cost money or not. Confirmed work on i-phone 3G. Thanks, Dude! It’s matching the setting info from the carrier company to the settings on the iPhone that I really need clarifying. Much appreciated. I have an unlocked Iphone 3Gs and recently udpate the software to 4.3.3 and now I am not able to send or received picture messages. I have set the setting as prior for the APN and MMSC but still not working. Does anyone have any solutions? I have same problem, unable to send or receive pictures., please update me with solution.. Hey!! Thanks man was doing everything available on the net, but nothing worked. Thanks for such a simple solution which actually works. Thanks again. hey thanks!… this worked perfectly for my US iphone! Can anyone help – I bought unlocked I phone 4 from Dubai – allegedly phone from Malaysia but all visible settings are chinese. Put T Mobile sim in phone in Dubai and it worked fine using their network DU – received and made calls and received and sent texts. Now I am back in UK nothing working. Profiles show china mobile – SIM accepted and shows T-Mobile UK. No-one here knows what to do – phone is not locked. It looks like the phone is not registering with T-Mobile – any idea what profiles I should enter into phone if any to make it work? Any help would be appreciated? Thanks. I can send pictures now. The Imessage feuture dind’t work in my iphone 3gs with the upgratte to 5. Do you now how fix it?